Most people know Rødkilde Park as the large green park situated between two long, beautiful avenues of lime trees rising towards Bellahøj from Hulgårdsvej. It is also known as the location of Vilhelm Bissen’s sculpture Youth on Horseback. But in another part of the park, hidden in a small forest, you’ll find an imaginative adventure playground. 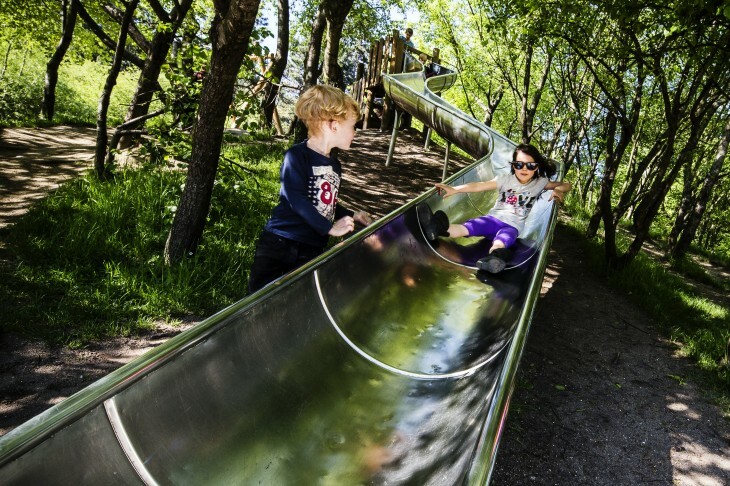 Located up toward Bellahøj and surrounded by trees and bushes, the playground’s treasures include a ropeway, a water-pump system, a ship’s hull, a small cave, a slide, natural sandy areas and lots of wooden bridges. In the bushes, you can play hide and seek and be completely concealed in the wild cherry trees. There are also tables and benches to enjoy your own food and drink. The big lawn has plenty of space for ball games and sunbathing. In the south-western part of the park, you’ll find proper pitches for ball games. And you’re also right next to the beautiful Bakkehusene houses, which are now listed. Inspired by Nyboder, and built 1921–23, these were among the first modern terraced houses in Denmark, built as a counterpoint to (and protest against) the rampant rise of apartment buildings at the time. They were an attempt to bring back a form of housing that had been typical of Danish towns in days of yore. Five years after the construction of the six long rows of identical terraced houses, each with its own garden, Rødkilde Park was added as a green oasis on the outskirts of the city. A century ago, what is now Rødkilde Park was nothing but countryside. The park is built on agricultural land from two farms. From 1938 to 1967, in the neighbouring area (now called Bellahøjmarken), an annual cattle show was held at which farmers from the whole of Zealand would show their animals. Facilities in the area include a campsite. The adventure playground is set in a deep forest of beech trees, wild cherry and evergreens. Wheelchair access to the paths in the park and some parts of the playground. Benches and tables in the playground provide places to enjoy your packed lunch.